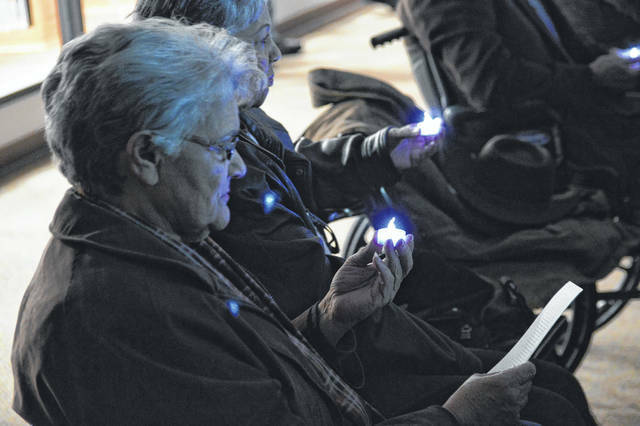 Members of the audience hold lights as they listen to the names of the Silver Bridge Collapse victims read at Bossard Memorial Library. Adler, E. Albert “Bert”, Jr.
GALLPOLIS — Gallia spent the evening Friday remembering the 46 victims of the Silver Bridge Collapse at Bossard Memorial Library during a special memorial event mourning a disaster that happened 50 years prior. While being in Gallia, Halley said she had crossed the current incarnation of the bridge countless times. “It wasn’t until this anniversary that I truly began to wrap my mind around what happened that night,” said Halley. For two years, there was no bridge across the Ohio River, Campbell continued. A ferry was used to handle traffic or one had to drive 14-miles up State Route 7 to Pomeroy to cross the river from the Gallia side. Campbell emphasized the importance of the bridge to the region and to both Ohio and West Virginia as U.S. 35 serves as a major artery of traffic. Smith said his grandfather was among those working a barge on the river who helped pull cars from the river. “It seems pretty amazing to me that they built that bridge in a two-year period of time,” said Smith. “I don’t know how government worked then, but I can tell you it does not work that way now,” Smith joked. Smith said he had a commendation on behalf of the Ohio House of Representatives for Gallipolis, the Gallia Convention and Visitors Bureau, Bossard Memorial Library and Gallia Chamber of Commerce for coming together to put on the 50-year event. Campbell and Bossard Memorial Library Director Debbie Saunders read the names of the 46 victims who died the day of the collapse. Members in the audience remained silent and held electronic lights as part of the ceremony. Dean Wright can be reached at 740-446-2342 and the Gallipolis Daily Tribune Facebook page.